st patrick’s day | Clare Cooks! Posted on March 13, 2013 by Clare Cooks! Even though I’ve posted two beef recipes in a row, I am generally pretty picky about my red meat. I usually only eat red meat on the rare (pun!) occasion I go to a steakhouse (NY strip, medium please). Red meat in general, and steaks to be exact, are the one thing I have yet to find and master a go-to, fail-proof recipe (quality beef is too expensive to experiment with). Brisket would be the one exception to the red meat rule. I can make a mean brisket. I did learn from the best. Mama CC makes the best corned beef I have ever had. Yes, I am completely biased, but really her recipe is wonderful. So wonderful I need to share it. 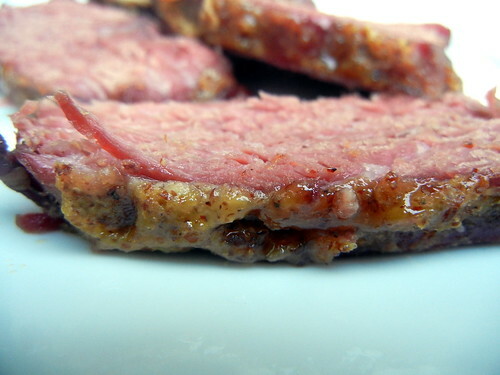 The special secret to her corned beef is the amazing mustard glaze she puts on top before serving. It’s delicious. There is something about the sweet, slightly caramelized mustard and the combination of salty corned beef that is out of this world. If you really want to impress any St. Patrick’s Day guests, I highly recommend this recipe. I would also recommend serving with a horseradish sour cream sauce on the side. It’s the perfect finishing touch. Place corned beef in a large pot. Add the beer/broth, onion, garlic, carrots, bay leaves, 1 1/2 cups water and the contents of the spice packet/brine, and bring to a boil. Reduce heat and simmer, covered, until very tender and easily pierced with a fork, 2 1/2 to 3 hours. Heat oven to 375ºF. Transfer the beef to a foil-lined baking sheet. Meanwhile, in a bowl, combine the mustard and sugar. Brush the beef with the mustard mixture and roast until the sauce has thickened and set slightly, 12 to 15 minutes. Transfer the beef to a cutting board and let sit 5-10 minutes. To serve, slice thinly across the grain. Posted on March 11, 2013 by Clare Cooks! This salad is definitely not your stereotypical Irish fare. It’s light and healthy and vegan actually, the exact opposite of meat and potatoes. It would be a great starter for any dinner party. It would definitely help balance out any and all corned beef and whiskey that might be consumed. I was actually surprised by how much I enjoyed this salad. I really like salads with multiple lettuces and this had a great mixture. The crispy, cool iceberg, peppery arugula, soft butter, and some spinach just because. They all really worked together and made each bite interesting. I basically opened the fridge and grabbed anything green. 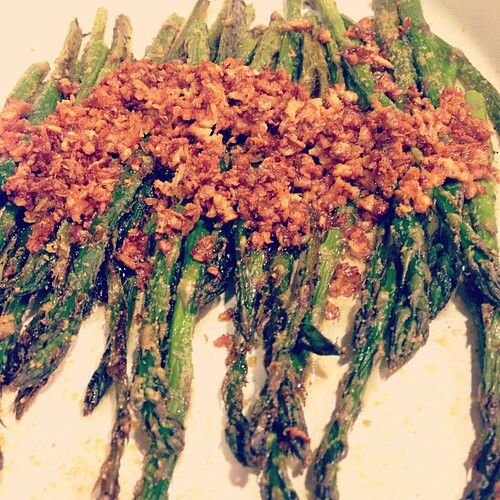 It worked out to be a festive little number and perfect early spring lunch. Johnny Cash wrote a song “Forty Shades of Green,” which I am a bit embarrassed to say that I only discovered yesterday. My Ireland born, Johnny Cash-loving father will be so disappointed. I remember flying into Dublin when I was younger, and shockingly, it wasn’t raining. I think she was trying to get me to shut up, but my mother told me to try to count the 40 shades of green out the window and that’s been the only connotation I’ve ever known until yesterday. In a small bowl, combine all the vinaigrette ingredients and whisk until thoroughly blended. In a large mixing bowl, combine the lettuces, green onions, and green onions. 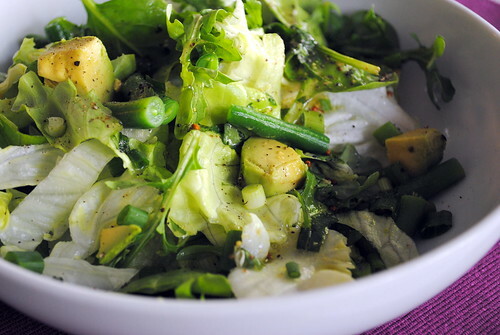 Gently toss the greens thoroughly with about 3 tablespoons of the vinaigrette. Place the greens onto six salad plates (white looks nice), arranging any of the little pieces that have fallen to the bottom of the bowl on top. Place several pieces of the diced avocado on each plate. Lightly drizzle with a bit more vinaigrette. Serve immediately.